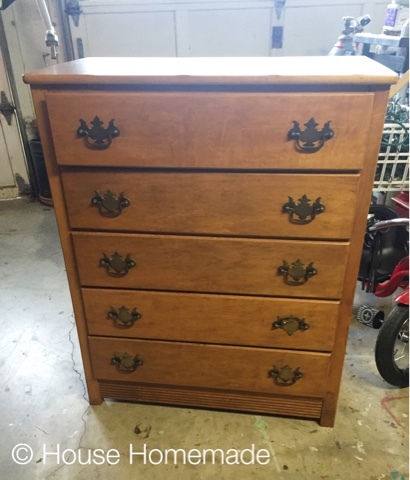 When I showed you this dresser last week, it was ready to be painted. There are 'after' pics at the bottom of this post but I thought I'd also share some progress photos. First, I painted the exterior, white. I lightly distressed it. I always suggest a little distressing, especially on furniture in a kids room so that if it gets scratched or bumped, it wont be too big of a deal. When I distress a piece, I try to think of where it would naturally get traffic. I always sand the corners, the sides, a little at the base and where the hardware will be. See what I mean?! Such a great use of time--(insert eye roll) After that hiccup, I decided to go ahead and wrap things up.. Here is the finished product! The blue-green matches perfectly with the pillow and those crystal knobs make it look so sweet and girly. I love how the light reflects through them. They haven't finished decorating the room yet and I can't wait to see what else is added. They started with a great vision and it is looking really awesome so far! Thanks for letting me have a small part in what will surely be a loved room.